Cloud seeding is a weather modification process which involves dropping of chemical agents into clouds to cause rain. Silver iodide, dry ice and even common table salt are key chemical agents that are seeded into upper part of clouds. This process stimulates the precipitation process and form rain. Global cloud seeding equipment market reached USD 97.7 Million in 2016 and is expected to register a CAGR of 7.1% across the globe during 2017-2024. 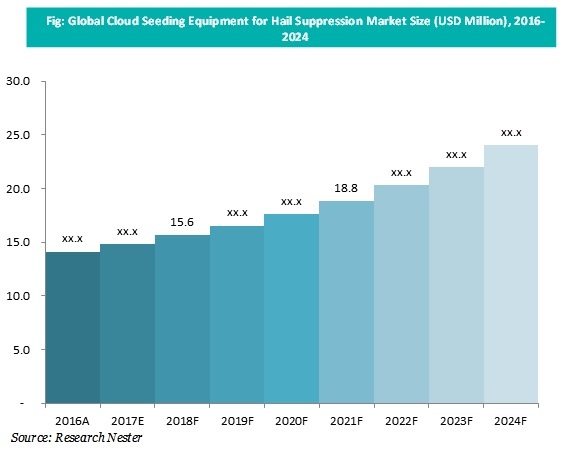 Global cloud seeding equipment market is expected to grow at a significant pace in future. A number of factors such as falling precipitation rate, increasing threat of water scarcity are likely to be the dynamic factors behind the growth of global cloud seeding equipment market in future. Further, growth in number of weather modification projects opens up a wealth of opportunities for the cloud seeding equipment market to expand significantly in future. In terms of regions, the global cloud seeding equipment market is segmented into North America, Latin America, Europe, Asia Pacific and Middle East & Africa regions. Among these regions, Asia Pacific is slated to account for a leading share of 38.9% by 2024 in the cloud seeding equipment market. The growth in the region can be attributed to decline in rainfall rate across the globe due to global warming and pollution. Decline in rainfall rate across the globe due to global warming and pollution is increasing the risk of draught conditions globally. This factor is anticipated to positively impact the growth of global cloud seeding equipment market. Rising use of cloud seeding system in dispersing fog and mitigate hail damage across the globe, has led to a strong demand for cloud seeding operations. Further, this demand is expected to robust the demand for cloud seeding equipment market in the near future. Moreover, declining figure of crops due to scarcity of water is expected to create many opportunities for the cloud seeding equipment market to grow and diversify all across the globe. Rising pollution and increase in global warming are major reasons which are responsible for decrease in precipitation rate across all regions. Increasing adoption of cloud seeding technology due to its advantages such as weather regulation and to curb pollution is also anticipated to drive the growth of global cloud seeding equipment market. Government initiatives such as increasing adoption of cloud seeding technologies to enhance the water level in different countries such as India is anticipated to propel the demand of cloud seeding equipment in upcoming years. Moreover, governments in countries such as India, UAE, and China are spending significantly on cloud seeding activities. However, high cost of cloud seeding services is anticipated to limit the growth of cloud seeding equipment market over the forecast period.